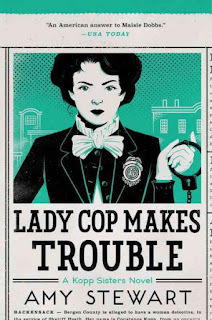 Have you been reading Amy Stewart's mystery series based on real-life turn-of-the-century deputy sheriff Constance Kopp? Girl Waits With Gun came out last year and Lady Cop Makes Trouble just came out. This has been an interesting series for us - Amy Stewart first came to our attention as a writer of non-fiction, with books such as Flower Confidential (a behind-the-scenes look at the flower industry), The Earth Moved: On the Remarkable Achievements of Earthworms, and Wicked Plants: The Weed That Killed Lincoln's Mother & Other Botanical Atrocities. Stewart brings all her research skills to bat for this new fictional series and the early 20th century lifestyle she portrays feels very real, but her historical characters are clever and her retellings of their adventures, ripped from news headlines of the day, are entertaining and well-crafted. As a tribute to Constance Kopp, the first female sheriff, we've compiled a list of other mystery series with sheriffs for protagonists, including local favorite Longmire!